Great Texas Birding Classic begins April 15 and runs through May 15. If you didn’t enter a team in the Great Texas Birding Classic by the April 1st deadline because you think you and your friends aren’t good enough birders. Fuhgeddaboudit. Next year, enter The Big Sit. The Big Sit is a wonderful category if you only have one or two good birders, and everyone else just has an interest in nature. Shelly Plante is nature tourism manager for TPW and organizes the classic. Only one person on a Big Sit team needs to ID a bird for it to go on the team’s checklist. It’s super easy, it’s easily accessible to everyone. And you go and bird in a 17-foot diameter circle for as much as you want in a day. I’ve seen people do it at their local park; I’ve seen people do it in their backyards, which is a lot of fun. So, there are so many different ways that you can do a Big Sit, and it’s just a lot of fun. We like to call it the tailgate party for birding, because people usually have a great food spread, and just a lot of camaraderie throughout the day. So that’s a lot of fun. Food…friends…feathers? That just screams good times. 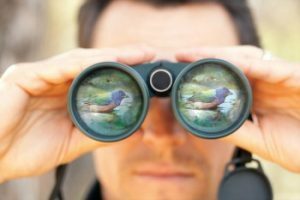 Find out what this year’s teams spotted across the state between April 15 and May 15 at birdingclassic.org or eBirds.org, where teams upload their checklists. Every team fills out a checklist and they upload it into eBird, which is an online bird checklist system through Cornell Lab of Ornithology that we use. So, teams are contributing to citizen science on an international level when they do the birding classic. Once they’ve submitted their checklist, they share that checklist with birding classic staff, and that’s how we know what was seen or heard. Registrations fees fund habitat projects in the state. We receive support from RAM Trucks. Built to Serve. This entry was posted on Tuesday, April 9th, 2019 at 12:00 am	and is filed under Birding, Great Texas Birding Classic, Habitat. You can follow any responses to this entry through the RSS 2.0 feed. You can skip to the end and leave a response. Pinging is currently not allowed.